Celebrating 15 years of nation-building in the Republic of Armenia and Artsakh. 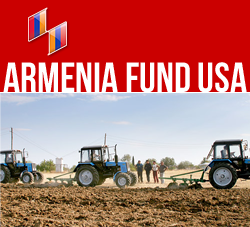 The year 2007 marks the 15th Anniversary of Armenia Fund — a pillar organization created after Armenia’s independence and mandated with the vital task of uniting all Armenians around the world to direct efforts toward development and revival of the nation. For 15 years the Fund, with its 19 affiliates across the globe, has touched countless lives in the Republic of Armenia and Karabakh.